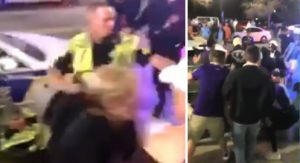 After the Orlando City match on March 5th, soccer fans turned violent, fighting each other and the police, including choking and beating a deputy. Welcome to Parramore, Orlando City soccer and thanks for bringing more violence into the community. An Orange County deputy was injured, beaten and choked by soccer fans after Sunday’s match. The deputy, who was working extra duty for the Orlando Police Department during opening day of the new Orlando City soccer stadium, was trying to break up a fight between soccer fans after Sunday’s match. He was even in full uniform, but soccer fans still decided to beat and choke him too. Is this what Mayor Buddy Dyer wanted to attract to downtown and more specifically to the historic African-American community of Parramore? However, the response from OPD and local law enforcement is striking quite a difference to the usual police response in Parramore and many in the community are upset. In fact, it’s pretty remarkable the amount of restraint law enforcement showed, but now many are questioning the different responses and measures taken by police. “We all know why there was a different police response,” Gelzer added. The Orlando Police Department brutality and excessive force problem has been quite clear. A video recapping some of the recent high-profile brutality and excessive force cases in Orlando has almost 6,000 views. So it is remarkable that even though a deputy was being beaten and choked, there was no use of tasers or pepper spray being reported, no guns drawn or shots fired. Of course it’s not reported because that would be bad PR for the soccer team, Mayor Dyer and downtown. Where was the riot gear or smoke bombs that have been used against Parramore street parties in the past? It’s odd that local police did not respond heavier while one of their own was being attacked. But worst of all, it’s not the normal police response in Parramore – it doesn’t even reflect normal police behavior in that area when there is no violence occurring. And the community knows it. Let’s be very clear about the incident before blame gets reassigned to the Parramore community or the homeless residents downtown. Soccer fans caused this violence. Orlando City soccer fans were fighting and arguing with New York City soccer fans. Soccer fans brawled and ended up beating and choking a deputy. What an opening day and what a welcome to the new neighbors in Parramore. Hopefully the violence caused by Orlando City soccer matches can be controlled in the future. Also, we can only hope all future police incidents in Parramore and across District 5 will be handled with such restraint from law enforcement. But again, we all know better. This article is a joke…. How about you clear up the fact that those starting the fights were NYCFC fans? You shouldn’t label just clear “soccer fans” as the culprits. I had a run-in with them while i was sitting in my car waiting to leave. Did I start something? No, i was clearly trying to leave and they kept standing in front of my car. You also make it seem like its the first time a soccer game is being played in Orlando. OCS just moved a couple of blocks down so this crowd is nothing new to the area. I could go on and on, but all you do is watch video and sit behind a computer and “assume” what happened. Funny, soccer fans don’t like being “labeled” like Parramore residents always get labeled in this town. Great piece!